Messina is a busy seaport and commercial center in northeastern Sicily, Italy, opposite the Italian mainland. On the morning of December 28, 1908, a magnitude 7.1 earthquake hit Messina, followed by a 40-foot (12-meter) tsunami. About 80,000 people were killed, and at least 90 percent of Messina's buildings, including its churches and palaces, were destroyed. Afterward, the city was completely rebuilt under standards for quake-resistant construction. The survivors went living in different parts of Italy. Another good part of them, were forced to sail for America, to start a new life. Another accident occured: a ship full of survivors collided with a luxury passenger ship, killing three. The others were saved. 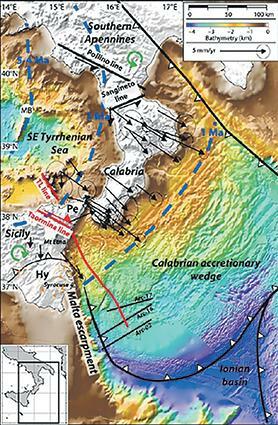 It is a very complicated area, tectonically. In simple terms Africa keeps bumping into Europe. But there are little bits of plate doing odd things in odd directions. Hence volcanism like Mt Etna, and earthquakes. Guess where would be a really, really dumb place to build a bridge?